Happy Monday! Hope you enjoyed your weekend. My was great. I attended the annual Women's Conference at my church and it was a great time in God's presence. Eliana and hubby enjoyed some time in the park while I was away. Spent the rest of the weekend doing some planning and resting. This top is definitely an attention grabber. When I saw it, there was no thinking twice. It's unique enough that you just can't pass it up. Although, the fact that it is a crop top and it is sheer did cross my mind. These could be easily solved by pairing it with a high-waisted skirt or pant and throwing a black tank top underneath, which was exactly what I did. I was originally saving it for our vacation sometime this summer but I just couldn't resist. I choose to pair it with this black peplum skirt. The skirt has its own unique feature but doesn't take away from the top, the main focus of the outfit. 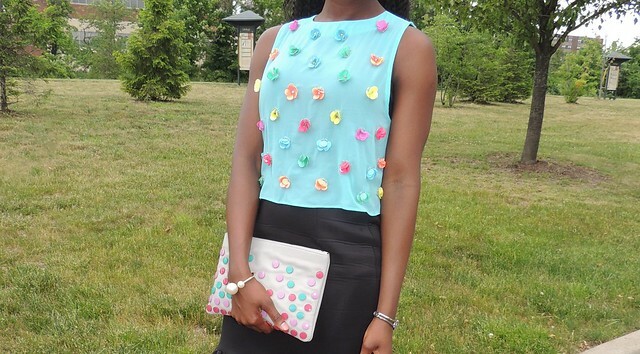 Completed the outfit with my candy colored clutch to compliment the top and a minimal sandal. Hope you're having a great day so far.